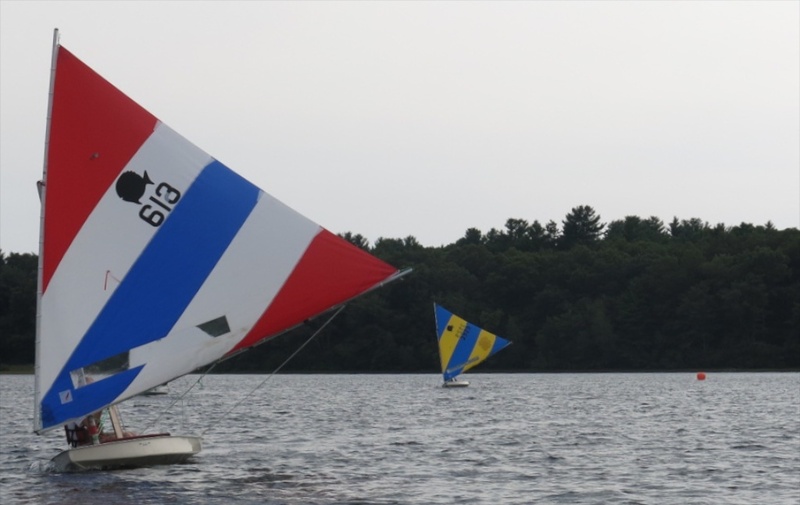 Massapoag Sunfish Fleet News: "He Came From Out of Nowhere"
For the second year in a row, the Saturday Sunfish Championship came down to the final day of racing before a winner was determined. And for the second year in a row, the winner was determined by a tiebreaker. And for the second year in a row, John Houstle fell just short of claiming the championship on the very last race of the season. There were 4 sailors on the line for today's racing. John Houstle, Mark Stoughton, Alex Sellar and Alan Silk. Alan has been sailing a lot on a J29, and this marked only his third or fourth time in the Sunfish this summer. Alex Sellar put in a stellar performance today, which he attributed at various times to either a sudden religious conversion, or a few more colorful alternatives. More than once, he came out of nowhere on his own private puff to challenge the race leader, gaining three 2nd place finishes along the way. Going into the final day of racing, John was just 4 points behind series leader Bernadette Levesque. By the rules of the throwout formula, five 1sts would have allowed him to take first place for the series from Bernadette, who was out of town and not able to race today. John and Mark Stoughton raced neck and neck most of the day, being within touching distance on most legs. John had superior boat speed all day, but Mark had better pointing ability, which made the difference when things were really close. In the first race, only Mark Stoughton gauged the starting line properly, leading for the entire race. John made up ground by the last leg, and within a few boat lengths of Mark when Alex Sellar came from out of nowhere, riding a puff to pass John and challenge Mark at the finish. John got a better start in the second race, and led all the way, although Mark put up a fight. John cemented his win on the last leg when he was lifted on starboard tack while Mark was headed, forcing him to tack. John took three more firsts, all closely fought battles. In the last race of the day (and the season), John was leading as late as the last turning mark and it looked like he was on his way to taking the championship, rounding about a boat length before Mark. Mark was able to out point John on every tack on the last leg, and took the win by about 4 boat lengths. John's four 1st place finishes today gives him 40 points for the season, and ties him with Bernadette for first place. Applying the Racing Rules of Sailing Tiebreaker procedure, Bernadette Levesque is the 2014 Saturday Sunfish Series Champion by virtue of her 16 first place finishes to John's 14. That concludes the 2014 Summer Sunfish Series. Congratulations to Bernadette for winning the series, and to Gary Werden for taking the Double Secret Wednesday Series. Next week sees Massapoag close the club for the season, and the week after that the Barrington Frostbite Series begins. Again this year, we will be providing our MYC@BYC coverage each week through the entire frostbite season.